It was a celebration worthy of the successes our teams have achieved since the St. Catharines Site hospital opened five years ago. Patients – both past and present - visitors, local dignitaries and Niagara Health staff gathered on Wednesday to celebrate the fifth birthday of the site by highlighting the care thousands of people in Niagara have received closer to home. 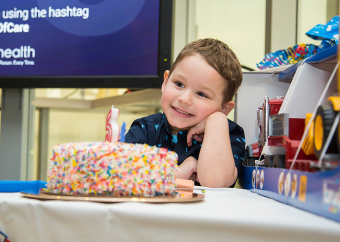 Even Alexzander Carriere, the first baby born in the hospital six hours after it opened, joined us to celebrate his fifth birthday. Everyone who attended sang Zander (as his family calls him) Happy Birthday, before he was given a special birthday gift – giant toy construction vehicles – from the physician who delivered him, Dr. Johan Viljoen, Chief of Obstetrics and Gynecology and Deputy Chief of Staff. “I was the first guy who got to see those chubby cheeks,” Dr. Viljoen said. Zander said he felt special today “because I was the first baby born!” he exclaimed. He said receiving so much attention made him feel like Batman, his favorite superhero. 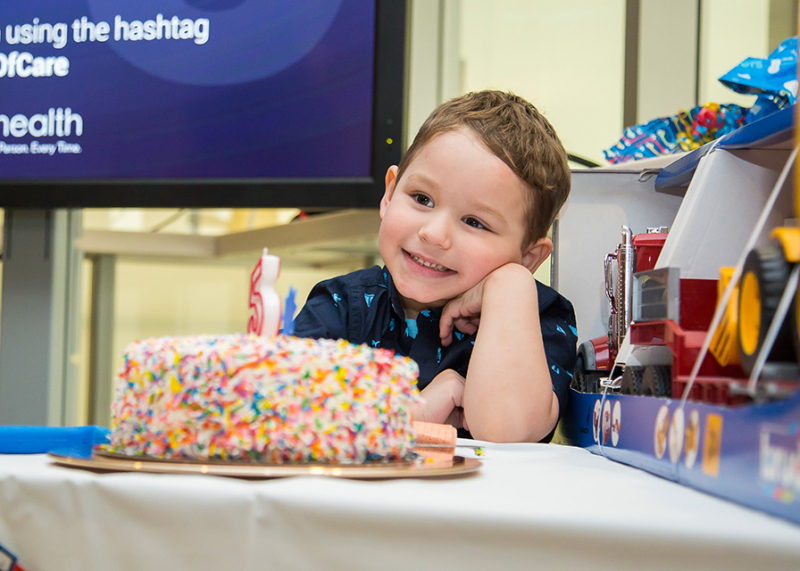 “We’re just so happy to be here, celebrating five years with the hospital and five years with Zander,” said Ashley McDermott, Zander’s mom, who has three other children, two of which were also born at the St. Catharines Site. Since the St. Catharines Site opened on March 24, 2013, thousands of cancer, heart, mental health and other patients have had access to vital healthcare services right here in Niagara. At the event, former patient and musical guest, Emmy-award winning musician Michael Kisur from Welland, performed an emotional song he wrote about his healthcare journey. The song, entitled Hope Lives Here, was inspired by the treatment he received through the mental health program which he credits with saving his life. Michael also provided the music for the video and digital presentation shown at the event. Here is a snapshot of the care our teams have provided in the last five years. The Walker Family Cancer Centre brought radiation treatment and other oncology services to Niagara for the first time. Since 2013, more than 3,600 patients have received radiation treatments at the St. Catharines Site. “Staying in Niagara (for radiation treatment) was really very helpful. I only had to drive 20 minutes. When I was coming five days a week, that made quite a difference as opposed to anticipating having to drive possibly a couple of hours,” says Sandy McBay, who received treatments for breast cancer. The Cardiac Care program has significantly expanded its services and added new procedures in recent years due largely to the opening of the Heart Investigation Unit (HIU). The HIU brought new cardiac diagnostic procedures and interventional treatments not previously available in Niagara. Since 2013, more than 10,000 procedures have been performed at the HIU. “Every week in my clinic, one of the first questions patients ask is, ‘Will I have to go to Hamilton to have this done.’ It’s incredible to be able to turn to them and tell them that this can now be done in St. Catharines,” says Cardiologist Dr. Adnan Hameed. The Mental Health and Addictions Program boasts the largest physical footprint in the hospital building and has introduced a number of new specialized programs, including services for patients requiring longer-term treatment in hospital and psychiatric emergency care. “We’re really working hard within our multi-disciplinary team to provide a lot of different services for people with addictions and mental health concerns. The team here works really well together,” says Nurse Practitioner Shahnawaz Ali. To see the videos, slideshow and photos from the event, please visit the 5th Birthday webpage.